"Where did you get the name Arion Productions?" I named my company after a horse. As you do. When I was a girl I was mad on horses and used to spend weekends at a riding school, thumping around the dressage arena on a pony with a mouth of iron, or cantering along on a trail ride imagining I was winning the Melbourne Cup. 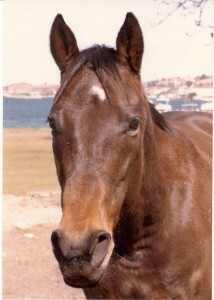 I didn't grow out of it - well, I grew out of imagining I was winning the Melbourne Cup but I did enjoy learning dressage - and when I got into the workforce I was able to afford a horse of my own. I had a lovely horse who sadly developed a form of arthritis which put paid to his showing and jumping career, so I looked around for another that I hoped would go far in the show ring. I found an ex-racehorse, who had raced under the name of Extra Strong. His breeding was impeccable, with Star Kingdom and other luminaries in his pedigree. He was beautiful, compact and faultless to look at. And he couldn't run fast enough to catch a cold. He was retired after two starts. His best effort was 14 lengths behind the second last horse in a maiden handicap at Kempsey.